Floating plastic debris in the marine environment can be degraded by reactions initiated by UV-radiation, hydrolysis, and microorganisms. Degradation of plastics releases chemical compounds to the water. The compounds and their amounts are dependent on the plastic polymer and the weathering condition of the plastic. These are the key findings in a recently defended doctoral thesis by Berit Gewert at the Department of Environmental Science and Analytical Chemistry (ACES). “Plastic, and especially microplastic, has received a lot of attention recently. However, there are still a lot of knowledge gaps”, says Berit Gewert, PhD student at the Department of Environmental Science and Analytical Chemistry, who defended her doctoral thesis in June and has focused on chemical pollutants released to the marine environment by degrading plastic debris. Since the beginning of mass production in the 1940s, plastic has been manufactured in quickly increasing amounts. In 2015 about 322 million tons were produced, for which around 8% of global oil production was used. Plastic debris accumulates in the environment and lately much attention has been drawn to the pollution in the world’s oceans. Potential risks associated with plastic are not fully understood. But it is known that marine plastic can cause direct physical harm to marine species by entanglement and ingestion of plastic particles by for example turtles, seabirds, fish and marine mammals. First, Berit and her colleagues conducted a sampling study and measured the levels of plastic in the Stockholm Archipelago. 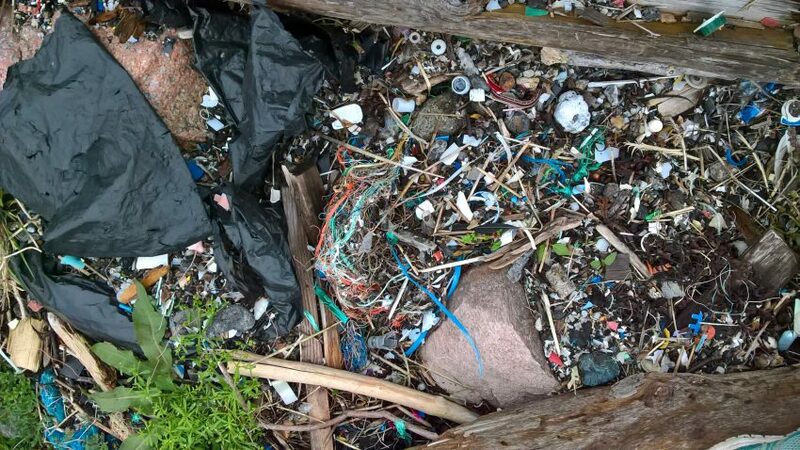 Most of the plastic retrieved from the archipelago was in form of fibers, and polypropylene and polyethylene were the predominant polymer types. These polymers are used to produce for example plastic bags, food packaging and plastic containers. These results are comparable with other studies conducted in other parts of the world. Berit and her colleagues then studied the chemicals in the water after plastic had been exposed to accelerated weathering conditions in the laboratory. “We hypothesized that plastic in the oceans will weather and release chemicals into the surrounding water. These chemicals can contribute to the total chemical exposure of marine organisms and can cause adverse effects”, she says. Most of the compounds that have been identified in the study have not been subject to hazard assessments. To evaluate potentials hazards posed by leachates from weathering plastic to marine organisms, they conducted an acute toxicity screening with the copepod Nitocra spinipes – a very small crustacean. The team thought that new products would be more toxic than aged plastic from the ocean because plastic products often contain many additives, some of which are known to be toxic. Additives can leach relative quickly from the plastic product into the water. Plastic that has been exposed in the marine environment for a longer time is expected to contain less additives. “However, we observed a higher mortality of the Nitocra spinipes when they were exposed to leachates from plastic collected from the ocean compared to their corresponding newly bought product. This could be caused by faster degradation rates and thereby more chemicals present in the water”, says Berit Gewert. She hopes that her thesis will contribute to the research field by providing new methods and pointing towards degradation products from plastic polymers as interesting chemicals to study in the environment. “For the general public, I hope that this thesis makes even more people aware of plastic pollution in the ocean, unknown potential risks, and the challenges we have to face”, she says. 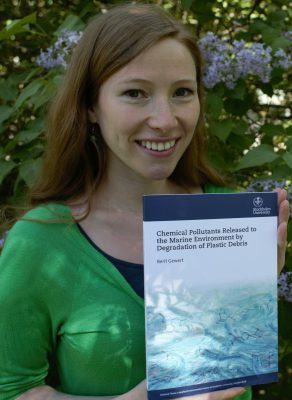 Berit Gewerts doctoral thesis “Chemical Pollutants Released to the Marine Environment by Degradation of Plastic Debris” can be read here.